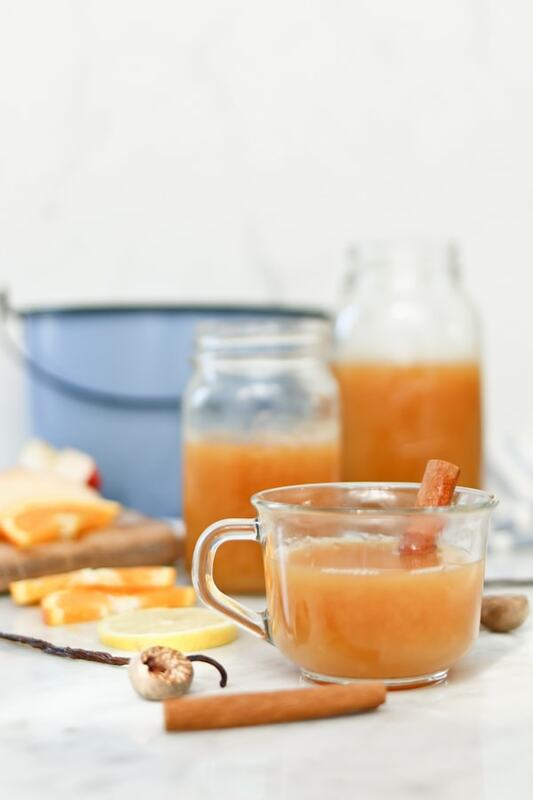 Wassail is a warm, naturally sweetened drink, most popular around the fall and winter holidays. 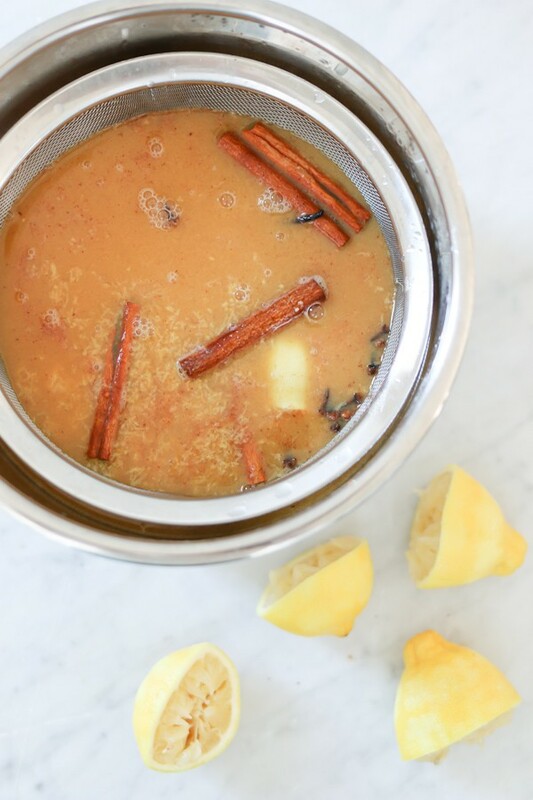 Fill your home with the smells of autumn with a steamy cup of naturally sweetened, homemade Electric Pressure Cooker Wassail. Hey everybody! This is Marci from TIDBITS bringing you a recipe that is sure to fill you with excitement and good memories. My most endearing sights and smells are all experienced in the Fall. Saying goodbye to summer is just fine by me when I can feel the cool breeze coming through my windows and see the mountains that surround my home covered in orange, red, and yellow. I feel giddy just thinking about it! And the smells of Fall? Sigh…they instantly take me to a happy place. Cinnamon, pumpkin, clove, apple, nutmeg, etc, etc. An Instant Pot is one of the most popular brands of electric pressure cookers. 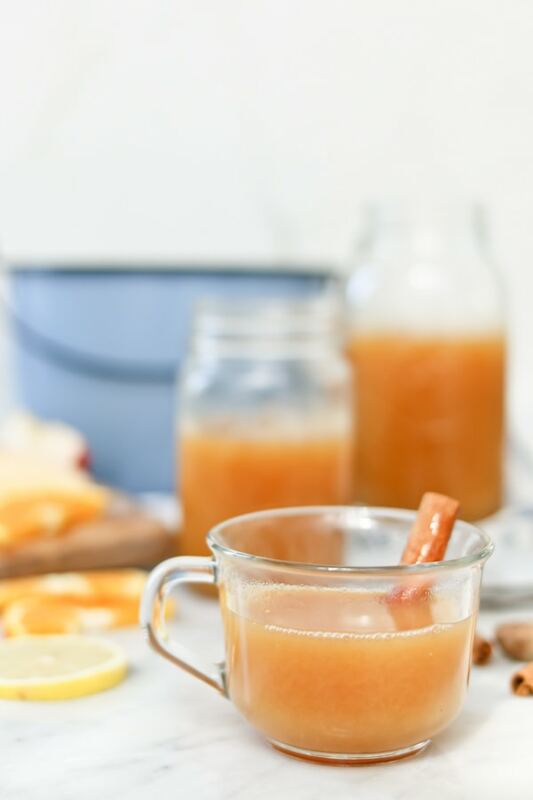 They are easy to use and your Instant Pot can help you create this delicious Wassail recipe! Wassail is the ultimate culmination of all of these wonderful smells. The smell of wassail still brings me memories of the before trick or treating excitement. However, as a child, when people talked about all the wonderful spices that were in wassail. I somehow interpreted that to mean it was spicy (in a hot sauce kind of way), and I don’t believe I ever even tried wassail until I was an adult! What a shame! But not really, I made up for it with lots of warm cups of hot chocolate! 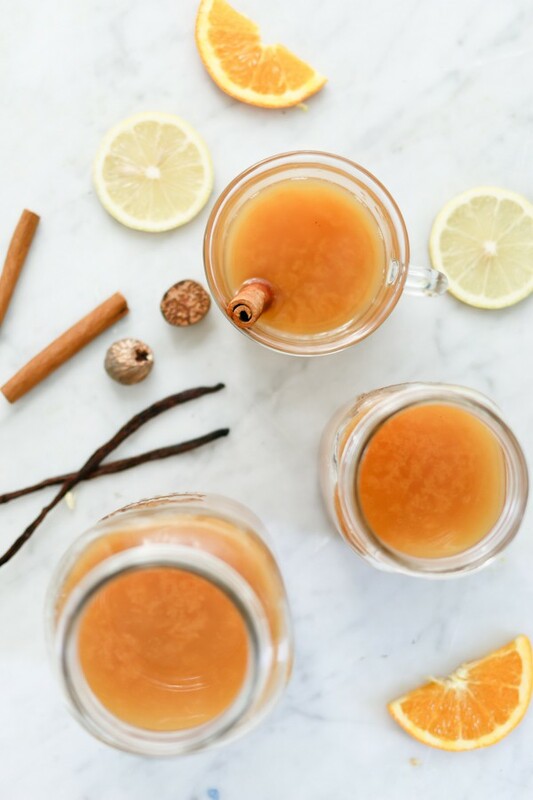 Wassail is typically cooked in a slow cooker for several hours in order to develop all of the “spicy” flavors. But not in this case! 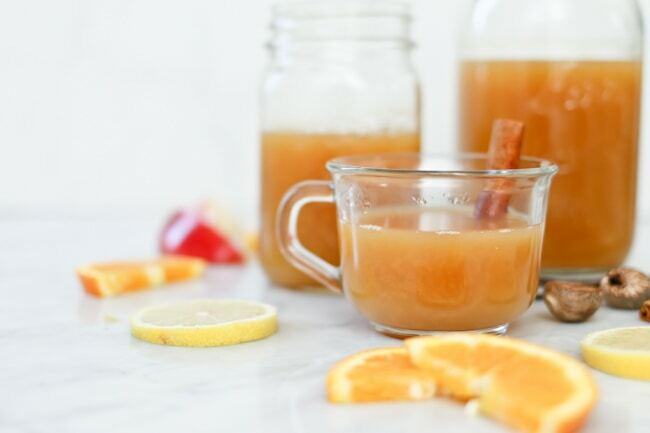 Just 10 minutes at high pressure in the pressure cooker will have your wassail bursting with all the intense fall spices we all expect and demand. And if you use this mesh steamer basket, all the inedible items are quick and easy to remove. Possibly the best part of this warm holiday wassail recipe is that moment when you release the pressure. I’m not kidding when I confess that I set the mood in anticipation for this moment. The kids got sent outside so I could have complete silence, I put my comfy pants on, set my phone to the side, and then…I flipped the valve and smiled as my house was instantly filled with the most delightful citrusy, spicy, apple-y, HEAVENLY smell known to mankind. No candle, will ever hold a candle, to that perfect scent. Simple pleasures are the best kind, right? So go ahead and buy that humongous jug of fresh apple cider that is popping up in grocery stores everywhere. It’s Fall, it’s October, it’s Halloween and that means it’s wassail time! 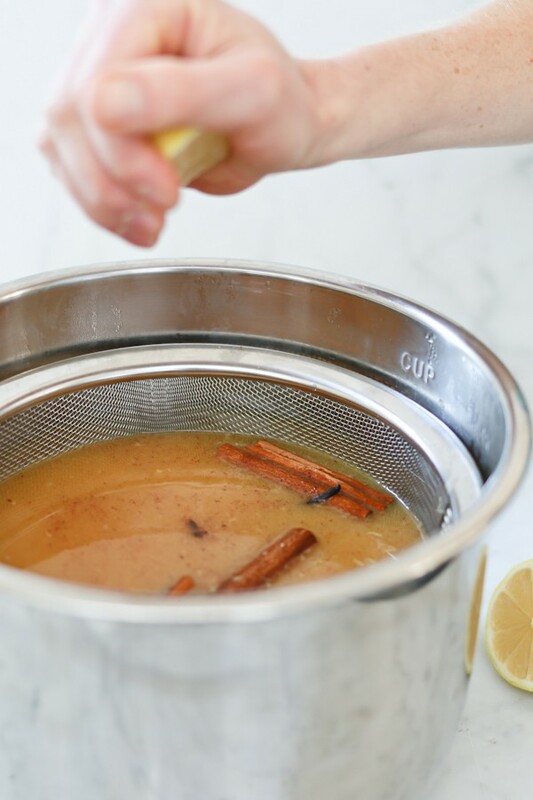 Pour apple cider and orange juice into the pressure cooker pot. Place mesh steamer basket inside. 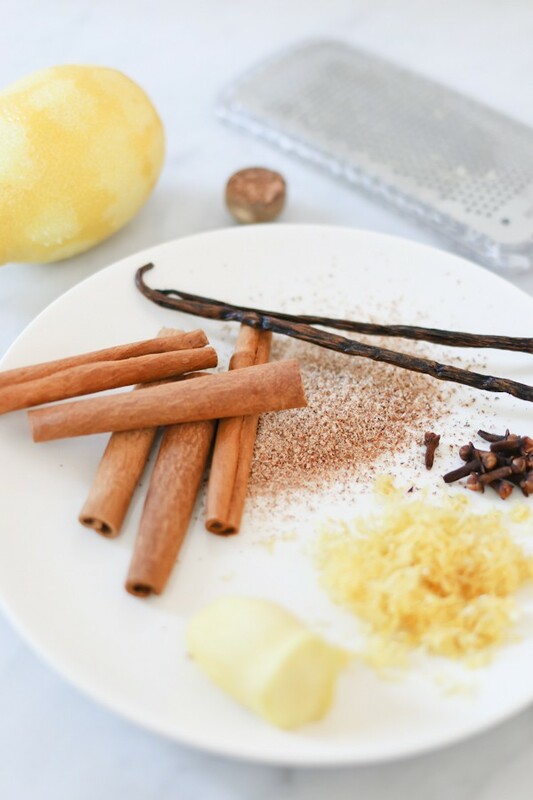 Add cinnamon sticks, cloves, nutmeg, zest and juice of lemons, ginger and vanilla beans to the basket. Secure the lid and turn pressure release knob to a sealed position. Cook at high temperature for 10 minutes. When cooking is complete, use a 10 minute natural release. Remove the steamer basket and discard its contents. Serve wassail hot from the pot. To keep the wassail warm and your house smelling amazing, turn the pressure cooker to warm or low slow cook setting. 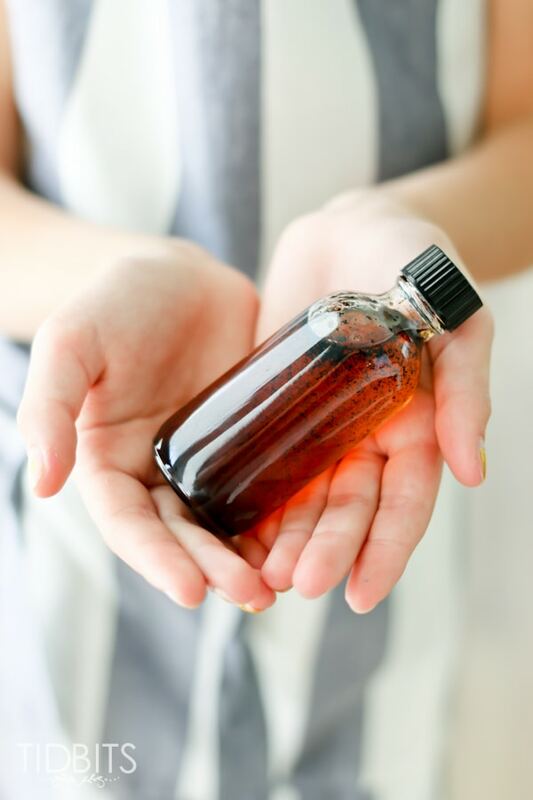 For other delicious pressure cooker recipes from TIDBITS, try making Homemade Vanilla Extract. It only takes minutes – not months!! 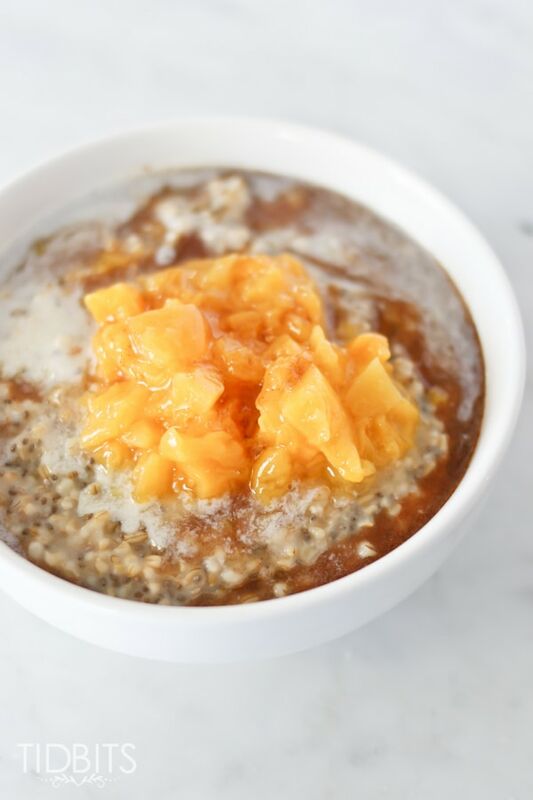 Or enjoy a healthy and fulfilling breakfast with our Peaches and Cream Steel Cut Oats with Cinnamon Maple Drizzle. Can vanilla extract or vanilla bean paste be used instead of vanilla beans? Thank you. Hi Janelle – yes, just add a little at a time to taste. Hello, can you still PC this if you cut the recipe in half? Tks in advance! Lisa, Absolutely, that will work just fine! Keep the same time, right?!? ?